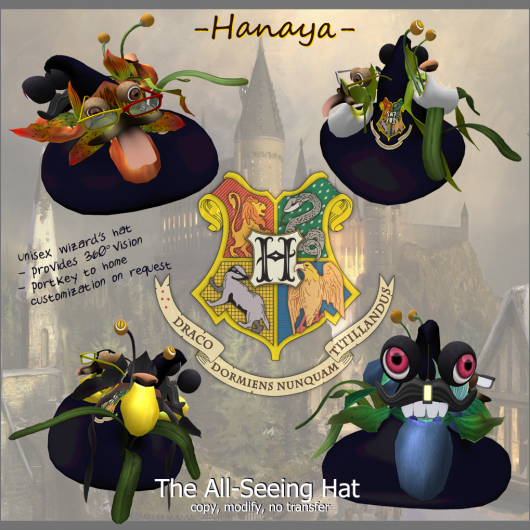 Introducing the -Hanaya- All-Seeing Hat for students of Hogwarts (and other Potter afficionados). The set of 4 unisex hats, bearing flora and accoutrements in the house colours of Gryffindor, Slytherin, Hufflepuff and Ravenclaw is a one-of-a-kind creation for the Harry Potter Hunt, which begins on Saturday, October 1st. 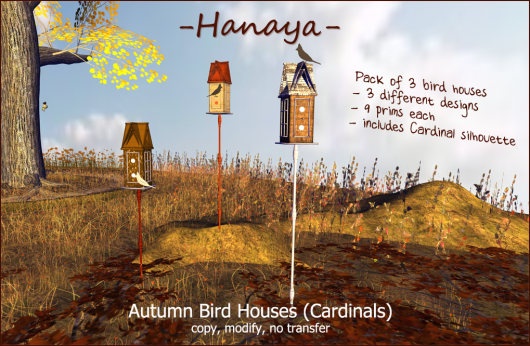 It will be available, free of charge, at the -Hanaya- in-world store for the duration of the hunt. The -Hanaya- All-Seeing Hat was created based on a principle first developed by Sephrenius Humdinger in 1874. Humdinger successfully bred plants of the genus Cypripedium Calceolus Omniocularis in captivity. The purpose of the hat is to give the wearer 360° vision, which is a particularly great advantage if the wearer gets disoriented and tries not to get hit by Muggle automobiles. The remaining problem is the appearance of the hat, which is somewhat odd when seen through Muggle eyes, and puts the wearer in danger of being locked away in a Muggle asylum. For this reason, we recommend that every wearer of the “All-Seeing Hat” familiarizes themselves with spells such as Alohomora, and practises apparition or carries a pre-set portkey. As a special service we will gladly program a portkey to your home into the hat, should you yourself be unfamiliar with how to do that. Please contact the creator by IM in-world for this service. The Hogwarts crest used in the image is available at Wikipedia. This entry was posted in Freebies and Gifts, News, Product Announcements on September 29, 2011 by moriko. 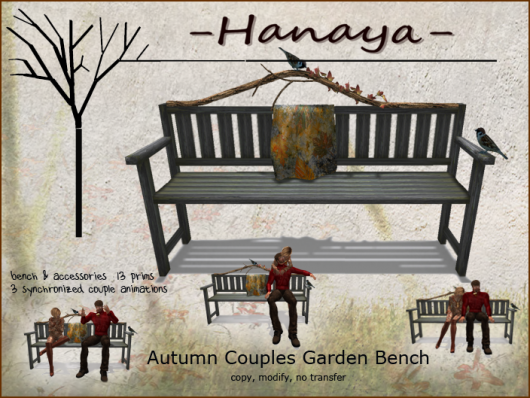 -Hanaya- Yummy Collectibles is pleased to welcome the general public to a small mainland park in the Hidden Lakes region on the continent of Sansara. 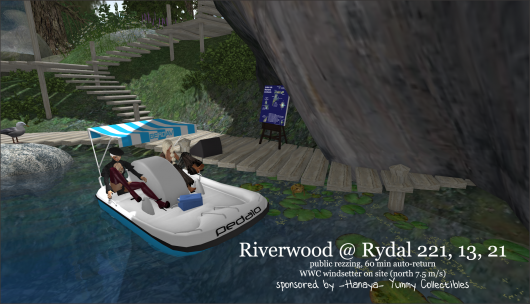 The park, which lies on an inland waterway, is open for public rezzing with 60 minutes auto-return and a WWC windsetter. 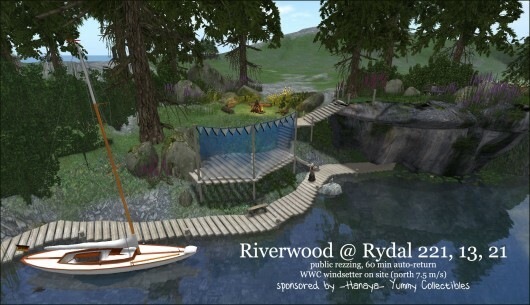 Visit Riverwood @ Rydal (opens a new web page). In addition to short-term public boat mooring, the park has benches, a campfire spot, dancing and of course, many birds, flowers and trees. Visitors are welcome to take out one of our paddle boats for a leisurely paddle up or down the river. Just click the paddle boat rezzer, hop in and start pedaling! And don’t forget to check out the built-in cooler for a selection of beverages. 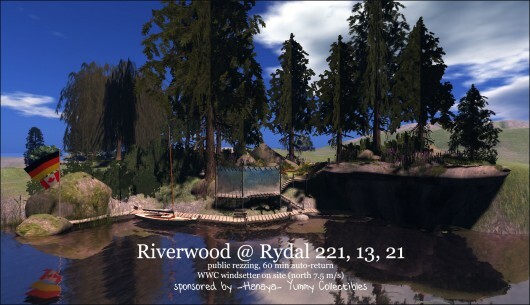 If you would like to add Riverwood to a trip destination and require a longer auto-return for a specific trip, please contact Moriko Inshan in-world by IM. WWC windsetter is on site, setting = north 7.5 meters per second. This entry was posted in News on September 28, 2011 by moriko. 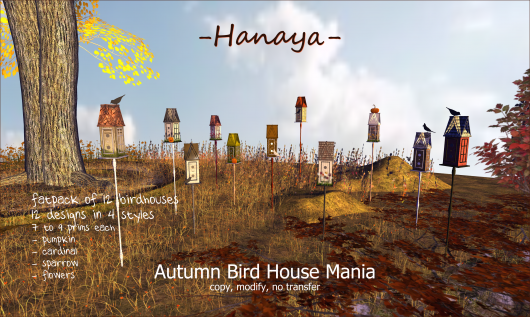 A dozen new autumn-themed bird houses are now on display at our in-world store and available for purchase. Each is a different design, and there are 4 types – some with silhouettes of cardinals or sparrows, some with pumpkins and some with little flower/grass fences. If you visit us in-world, you may notice that fall has arrived in the gardens surrounding the store – the product images in this post are taken on location. We hope you enjoy the ambiance and find something to take home with you. The mania pack (pictured above) gets you all 12 bird houses, 3 of each type. Or if you like, get the three-packs – 3 bird houses per pack of the same type (pictured below). Please note – single bird houses are available for purchase in-world only. Have an awesomely fabulous week! This entry was posted in Product Announcements on September 26, 2011 by moriko. Thirteen prims, sculpted ivy draped on a gnarly branch, a blankie to keep you cozy warm. And birds – two of them. Sound sweet? Well it looks sweet, but on this garden bench, you can argue have a serious discussion, then knead the stress out from his shoulders, give huggies and then sit and reflect on how great life together is. 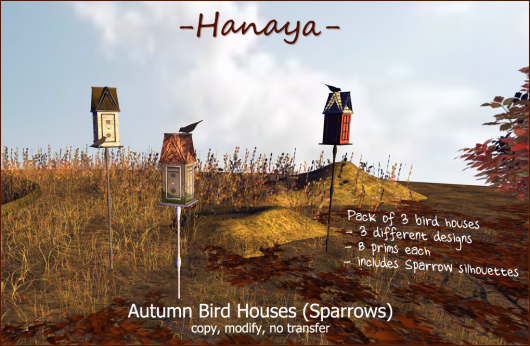 Out now in the New Products area of the -Hanaya- Yummy Collectibles in-world store (just walk in the front door), and soon to be out on the Second Life Marketplace. Matches our Autumn Iris Planter and is copy mod for your convenience. This entry was posted in Product Announcements on September 19, 2011 by moriko. Can you believe that in less than one week, autumn begins? 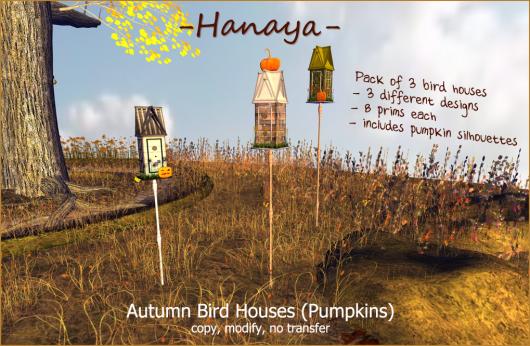 The fall vegetables in my real life garden are maturing, and so are the pumpkins in the -Hanaya- Magical Pumpkin Patch, a brand new product release currently available in our in-world store and the Second Life Marketplace. Why magical you ask? Well 2 of the pumpkins magically turn into lit jack-o-lanterns during the Second Life night time (if you are on a private estate, make sure that it is not set to a fixed/constant time if you want the magic to work). The set also includes 4 unisex PG animations, so you can chill on either corner of the market stall, or weed and admire the biggest pumpkin in your patch. Packaged in an easy to use Autorezzer, the Magical Pumpkin Patch is copy/mod for your convenience. It is rezzed in the new product showcase area of our in-world store, directly at the landing point – if you have time, come see it and try out the animations. To make hunting easier, there is now a Current Hunt Hints Board at our main store landing point. Just click the board, then choose which hunt you want the hunt hint for. Have fun and have an awesome weekend! This entry was posted in Events, Freebies and Gifts, News, Product Announcements on September 16, 2011 by moriko. Did you guys hear that this autumn’s Macabre Hunt theme is Le Cirque Diabolique? If you know me, you know that I love making stuff for the pure fun of it. When I heard about this hunt, I had to join in, even though I was over-committed this month with real life, as well as already being in 3 other hunts this month. But .. Le Cirque Diabolique? Of course I had to do it! For the last month, my living room has been echoing with strains of slightly off key, evil calliope music while visions from H. P. Lovecraft novels drifted in my head. I researched antique wagons on the net, fiddled in Photoshop and tp’d in friends to try crazy animations. 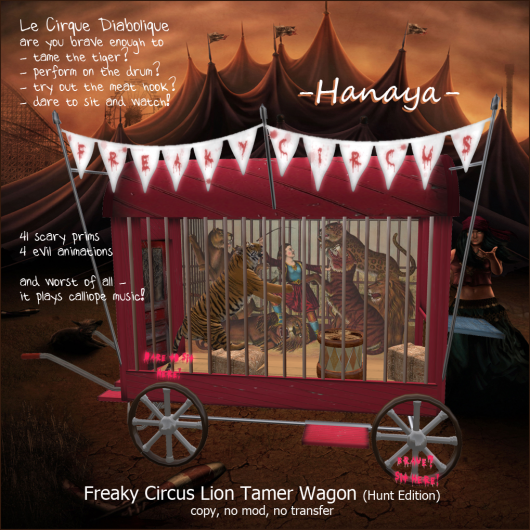 The result is the -Hanaya- Freaky Circus Lion Tamer Wagon. 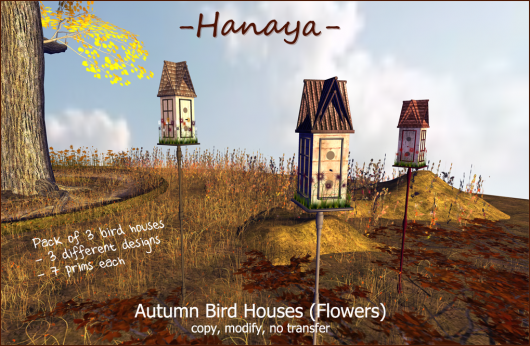 A one-of-a kind decoration for Halloween, a must for circus lovers, a fun thing for fairs and best of all, a free gift from -Hanaya- to you during the Macabre Hunt. Four evil animations allow you to get in the act. Enter the cage if you dare and tame the tiger, pose on the lion drum, or try out the meat hook (evil laughter is heard). Or just sit outside the cage and watch. But be careful – evil lurks beneath! More information on the hunt including a list of hints for the other awesome stores that are participating is on the Macabre Hunt blog. The hunt runs from September 17 – October 15, 2011. The image used on the back drop of the cage inside the wagon is based on The Lion Queen, a chromolithograph published c1874 by Gibson & Co. (Cincinnati, Ohio). Reference is here. The background of the info poster is Horror Circus, a digital art piece by ~leocomix (Leonardo Soares), a Brazilian illustrator who is part of the deviantART community. Reference is here. This entry was posted in Events, Freebies and Gifts on September 15, 2011 by moriko. I read that fairy rings can mark the location of gateways into elfin kingdoms, or places where fairies and elves gather and dance. According to legend whose origins are lost in the mists of time, a ring of mushrooms sometimes appears in those places. Most prevalent in early autumn, especially at Samhain, magical places like fairy rings can sometimes be a dangerous place. So we have made sure that the -Hanaya- Love’s Fairy Ring is protected by secret charms to keep you safe. 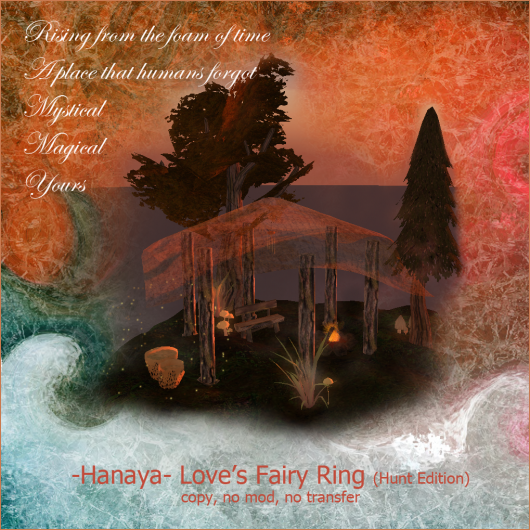 Created especially for the Miracles of Autumn Hunt 2, Love’s Fairy Ring will be available at the -Hanaya- main store starting on September 16, 2011 for the duration of the hunt. The playset comes in a convenient autorezzer – follow the instructions for easy set up. Included in the set is a forest floor base with trees, a rustic bench, which contains 4 animations so you can sit and cuddle with a loved one, or chat with a friend as you watch and listen to the crackling of the fire. A magical gazebo crafted from knotty trunks shelters you and overhead the wind chime makes occasional tinkly sounds as the breeze ruffles your hair. Daytime and night time bird sounds help to set the mood, as do the sparkles emanated from the magic funnel fungi. If you take a deep look inside the fungi, you may see your reflection gazing back at you in the animated ripples of the surface of the water – or will you see the face of your own true love? This entry was posted in Events, Product Announcements on September 13, 2011 by moriko. 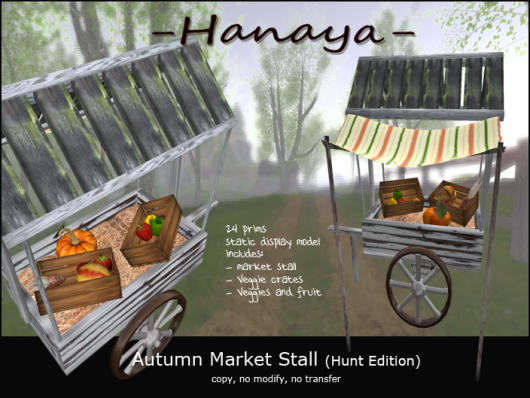 As I get ready to decorate my real life front garden for fall, and attend a medieval market in a nearby village next weekend, it seems appropriate to release the -Hanaya- Autumn Market Stall (Hunt Edition). Filled with fresh autumn produce from my virtual garden, the sculpted peppers, indian corn, melon and apple are all copy. A lovely squat pumpkin with a leaf completes the veggie line-up. The complete cart as pictured below is 24 prims, but you can rez as many or as few of the items as you like, so I hope you will find a corner of your home to place it. Starting on September 15th, it will be available at our in-world store as a hunt gift during the Home and Garden Falling Leaves Hunt. This entry was posted in Events, Product Announcements on September 11, 2011 by moriko. 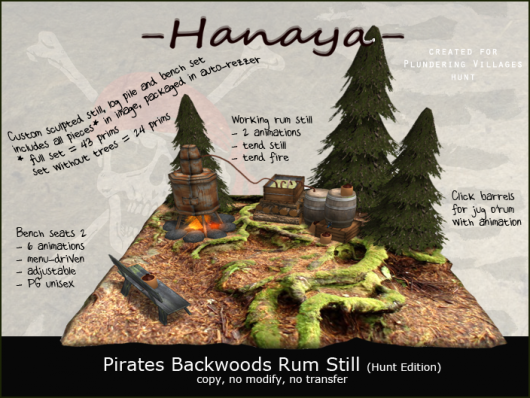 -Hanaya- is Calling all Pirates! It seems appropriate that I start this blog post with the first two lines of this famous sea shanty, from Robert Louis Stevenson’s Treasure Island. You ask why? Well it is like this … *inserts image*. Today is the start of the Plundering Villages Hunt, and of course, -Hanaya- is participating in it. Who could resist making something cool for the pirate in all of us? And I did have tons of fun – especially with the custom-sculpted still I made, complete with copper tubing partially submerged in a crate line with tin, filled with rippling water to help the condensation process. The set comes with 8 looped animations, 6 in the menu-driven bench and two that let you tend to the fire and fiddle with the tube apparatus. And of course the rum barrels give you and your pirate friends jugs of rum so you can get properly wasted quench your thirst. Speaking of wasted, my fave animation is in the bench – and that is all I am saying. You guys need to discover the rest for yourselves! The Plundering Villages Hunt starts on September 1st and runs until September 30th, 2011. And when you find the -Hanaya- Hunt gift, beware! This entry was posted in Events, Freebies and Gifts on September 1, 2011 by moriko.